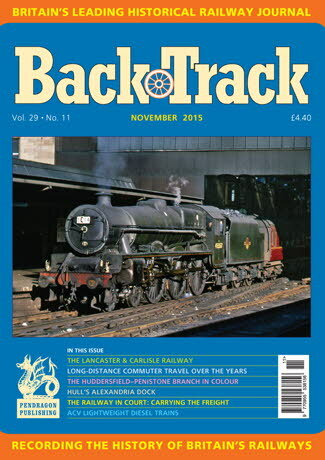 Railway Magazine | BackTrack November 2015 journal from Pendragon Publishing. Smarties from the Tube - colour spread by David Cable of unusually -liveried London Transport trains. The Formative Years of the Lancaster & Carlisle Railway: Part One - Jeffrey Wells looks at the origins of one of the best-known sections of the West Coast Main Line. From the Pendragon Archive - Eric Bruton's A4 Pacifics - archive photos taken at the southern end of the East Coast route. Up the Junction - Michael H.C. Baker reflects on some unusual railway junctions in Ireland and in the UK. Long-Distance Commuting over the Years - Alistair F. Nisbet recalls experiences on the Southern Region between Basingstoke and Waterloo. The Huddersfield to Penistone Branch - colour spread by Gavin Morrison. Hull's Alexandra Dock - Mike G. Fell reviews the changing fortunes of the Hull & Barnsley Railway's principal legacy. Mid-Wales Memories - The Mid-Wales line to Talyllyn Junction and Brecon photographed in colour by Tommy Tomalin. The Railway in Court: Carrying the Goods - some railway legal cases discussed by Bill Taylor. The ACV Lightweight Diesel Trains - Eric Stuart looks at an early 1950s diesel multiple unit experiment. Charles Nash and the Railway Theft Gangs - Alistair F. Nisbet uncovers some Victorian felonies. Displays of Power: The Edinburgh South Suburban Railway and its 'Sideshows' in the Victorian era - by Ian Murray. Tilbury Riverside - Paul Joyce remembers its last day in 1992.